If Cinderella were to have a lavish wedding reception of her dreams today, I'd imagine her wedding cake would look a lot like this 3-tier wonder. 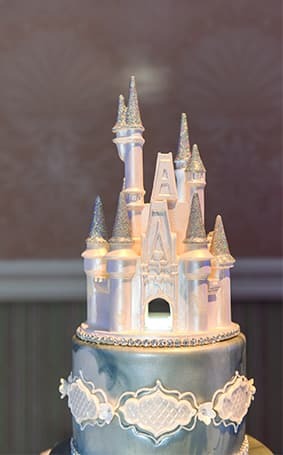 With its signature castle cake topper and overall awe-inspiring appeal, this masterpiece may look like your classic Cinderella Castle cake. 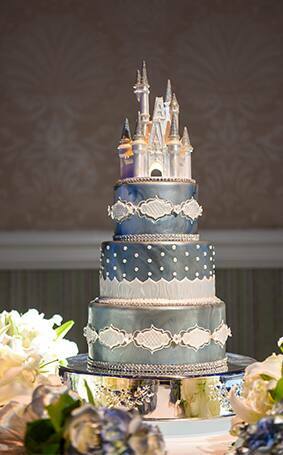 But if you look closely, you'll see this Disney's Fairy Tale Wedding couple personalized their cake with a little blue shimmer and intricate white details that surely had their guests wondering if they stepped foot straight into a fairy tale. Looking for more Wedding Cake Wednesday inspiration? Visit our Dream Boards.